Plants in INDEVCO Paper Making division are committed to further 'greening' their tissue mill operations. 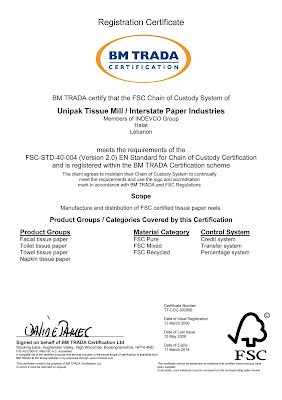 INDEVCO's two tissue mills in the Middle East have been awarded Forest Stewardship Council (FSC) and Programme for the Endorsement of Forest Certification (PEFC) Chain of Custody certifications for manufacturing and distributing tissue paper reels. 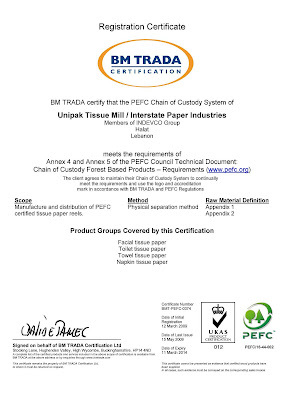 In May 2009, BMA Trada granted the certifications to Unipak Tissue Mill (UTM) in Halat, Lebanon and Interstate Paper Industries (IPI) in Sadat City, Egypt after approving their systems in March 2009. Unipak Tissue Mill and Interstate Paper Industries are members of INDEVCO Paper Making, a division of INDEVCO Group, the "Local Multinational of the Middle East". They manufacture a total of 80,000 MT/year of 100% recycled, partially-recycled, as well as virgin parent tissue reels for the UK, Europe, the Middle East and Africa. Unipak Tissue Mill recycles pre- and post-consumer paper, minimizes the quantity of fresh water used per ton and manages an efficient Effluent Treatment Plant. Jumbo Tissue Rolls are produced in INDEVCO plants in Lebanon and Egypt. Interstate Paper Industries expects to purchase about 30,000 MT / year of waste paper from the local Egyptian market, about one-third of the country's annual waste paper collection. IPI consumes less power and water than international best practices and purchased fossil fuel-efficient equipment to reduce air emissions. All waste water from the plant is re-used, while net solid waste is either recycled or collected by a licensed contractor for disposal in Sadat City's landfill. Programme for the Endorsement of Forest Certification (PEFC) is the world's largest forest certification organisation that promotes sustainable forest management - environmentally, socially beneficial and economically viable management of forests for present and future generations - through independent third party forest certification.